Head of the Roman Catholic Church, Pope Francis, has advised everyone to embrace peace and see politics as service to humanity. The theme of political peace was apparent throughout the Pontiff’s New Year message to the world. The Pope urged people to shun violence and adopt peace in their dealings in the New Year. He noted that the ultimate result of of good politics is peace, adding that peace, just like hope, is a flower struggling to blossom in the stony ground of violence. He explained that politics that is not seen as service to society will amount to oppression, destruction and marginalization. He stated his belief that political power in the right hand will be exercised rightly, calling on politicians to join the peace wagon. The Pope’s message, which contained lessons many Nigerians can relate to, also served as a reminder of the vices in politics which has been Nigeria’s plight for decades. 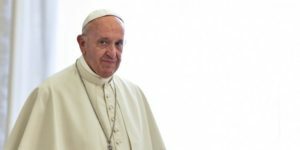 Pope Francis mentioned corruption in varied forms, misappropriation of Government funds and resources, exploitation and denial of human rights, forceful justification of power and dishonest gains as the fruits of bad politics. This entry was posted in Christianity, News, Politics, World. Bookmark the permalink.